Home > Around the World > Does the Mediterranean Diet Stretch to Fast Food? The Mediterranean diet is well known for being fruit and vegetable laden and good for your health – but as the Med is becoming richer, it’s also taking on some of its richer European neighbours’ bad habits when it comes to fast food. Supermarkets and fast food restaurants are more and more prevalent in Greece, Italy, Spain and Portugal than they were, and the usually slim nations are getting as fat as the rest of us as a result! There are fast food chains in Greece. As well as the big national franchises there’s the Greek ‘Goodies’ chan. If you’re tempted into a Greek Mc Donald's or a KFC you may well be pleasantly surprised to find that the menu is completely different to the usual one in the UK or USA, to cater to Mediterranean tastes. You can also have beer with your meal. The menus often include pasta as well as local specialities such as squid. They can be expensive though. In Turkey fast food is getting more available but isn’t really popular yet – the Turks seem to enjoy their food home cooked and authentic. Italy is another not-quite-convert to the fast food movement – in fact Italy is the home of the ‘Slow Food Movement’ so you would expect there to be fewer quick and easy snack joints there. The Italians like to take their time. The only exception is pizza – there’s a home grown pizza chain called Spizzico specialising in every type of pizza you can think of. There are also sandwich dispensers on some railway stations, and sandwich bars offering Paninis in different varieties. The Italians are big fans of coffee and pastry, as are most of the Mediterranean countries and coffee bars are in abundance in place of fast food chains. In Italy, the street vendors are great for delicious ice creams in the summer months and roasted chestnuts known (castagne) in winter. 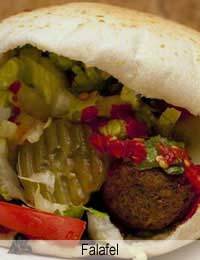 If you’re in Greece or Turkey, there’s usually a falafel stand nearby, where you can pick up falafels, along with other delicious snack items like souvlaki, salads, vegetables and gyros with pita bread. The Gyros and the Souvlaki are both traditional Greek snack foods but one cafe’s interpretation of a gyro may be another’s souvlaki so it’s best to ask first what you’ll be getting. A souvlaki is traditionally small pieces of meat and vegetables on a skewer, and sometimes served in a pitta bread. A gyro is also minced meat, tomatoes, onions, and tzatziki, but not usually skewered and also served in a pitta. Hence the confusion. If the skewer is important to you, ask first! Greek fast food dishes also include pies and food that can be eaten while you’re on the move. You can pick up fresh individual-size cheese pies, spinach pies everywhere in Greece, with the cheese pie being the favourite. They are often eaten in between meals but can also be a good lunch choice. If you’re not quite that hungry, try a visit to a tostadiko, where you can create your own toasted sandwich. In Turkey, Köfte ekmek (meat balls & bread) is often on sale from stalls or vans – served with onion, tomato, salad and parsley. For non meat lovers there’s the Simit, which is a ring-shaped bread topped with sesame seeds. Pizza lovers will enjoy the lahmacun which includes mince meat in a thin pastry with tomato, onion and seasonings that include either mild or hot peppers. For a sweet treat, try a findik (hazelnut) lahmacun. There’s a wealth of mouth watering options if you’re stuck for a snack in a Mediterranean country. It would be a shame to opt for a bag of crisps or a standard burger!